Alison says she has always been a maker. When she was a child, her Mum would give her paper to draw on and she would cut it up and stick bits together to make little animals. Alison was ‘arty’ all through her school life, and enjoyed the discovery of different materials, like plaster and clay, and this motivated in her to go to art college and to University, where she discovered the utter joy of metal and welding! Due in part to her subject matter, Alison has been very lucky in the last few years to be offered several solo shows at RHS gardens. 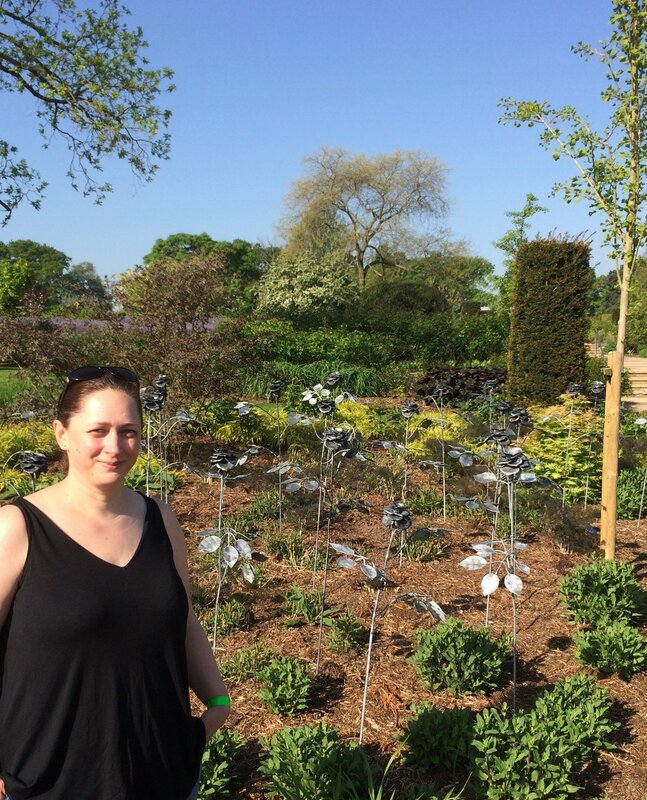 Along with her flowers, butterflies and bees, this year Alison was able to enhance RHS Wisley’s new rose gardens with her roses, each of which was made up of some 43 individual pieces. Each separate petal was hand cut from 3/4 mm mild steel sheet with a pair of tin snips, hammered and bent to shape, then all the pieces were welded together. Finished roses were then galvanised and etched for a rust free, natural metal look (a few of them have her signature little ladybird on). The project took her 3 three months to complete! Alison undertakes lots of commissions, but only accepts them if they fit with her style. She has been known to turn down enquiries for ‘random items’ like aeroplanes, which do not sit well with her body of work. Sometimes Alison’s work is left in its natural colour, or burnished to glow, like the butterfly here (see left). Sometimes she adds colour, making them come alive like the ones below. Private commissions have included a wall piece with really detailed ferns, each leaf hand cut and hammered to shape. Alison was charmed when the lady who commissioned it came to the studio and spent an afternoon helping her to cut out the bits. The leaves had a few little bugs attached - just to take the viewer by surprise. Another special birthday commission completed last year was a family of parakeets to remember a special holiday adventure. It was secretly arranged for the birthday girl to visit one of Alison’s events, so she could have a go at working on part of the sculpture (without her realising it would later be her own gift). Alison also runs workshops in schools, getting groups of children to help her cut, file and hammer bits of sculptures that she then completes and returns to the school. Alison sells her work mainly through garden sculpture exhibitions. She exhibits with the Surrey Sculpture Society quite often and occasionally takes part in craft fairs, all these helping her build up a good following and people now regularly contact her when they want a piece for a special occasion. Alison will be taking part in Surrey Artist Open Studios from her studio in Shere again next June.